Creative Scraps by Peggy Lee: Stampers Rejoice!! 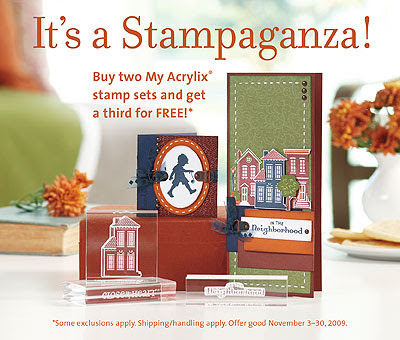 Stampers and Scrapbookers it's time to rejoice and take part in this awesome Stampaganza! When you make a purchase of any two stamps sets (sizes a,b,c,d or e) at full retail price, you will recieve a third stamp set of your choice for FREE! (equal or lesser value-a savings up to $22.95) Choose from any stamp set offered in any of the 2009 Idea Books or current product review! !